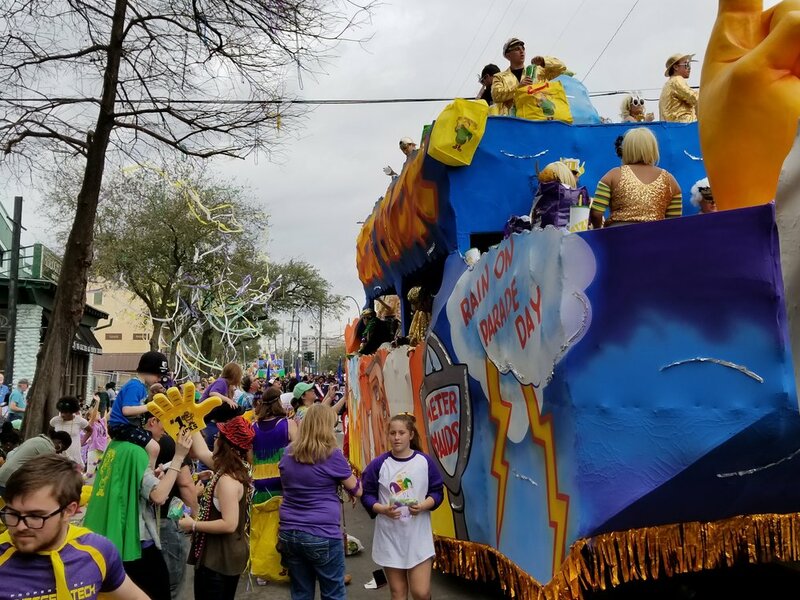 What is perhaps the biggest parade of the entire Carnival season rolls in the Mid-City area of New Orleans on the Saturday before Mardi Gras. As much as we love watching Endymion's fiber optic floats, celebrities and great bands, we opted for something different in 2018. A few hours before Endymion rolls, two parades in Uptown put on quite a show. 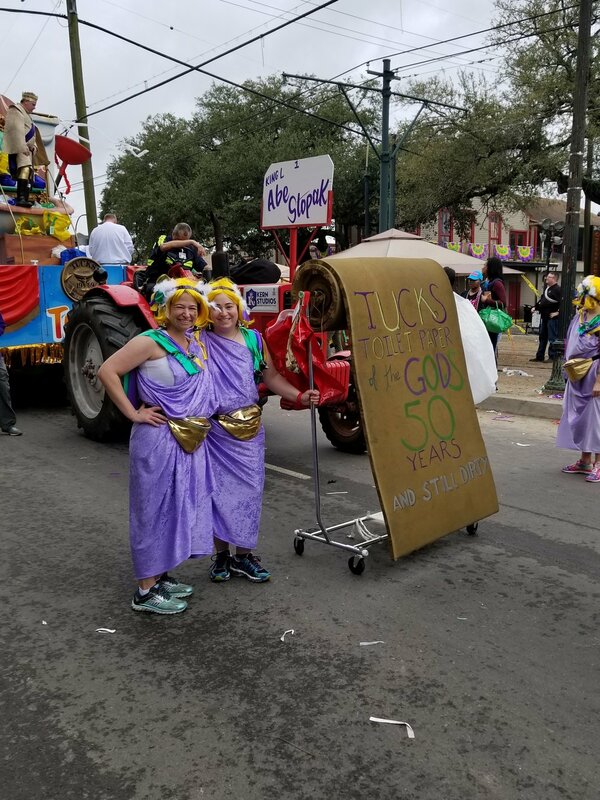 The Krewe of Iris has been a part of Mardi Gras for more than a hundred years, and the Krewe of Tucks celebrated its 50th parade in 2018. The first parade to roll is Iris. Founded in 2017, the krewe chose to celebrate this year with a "New Era" theme. Each of the 37 floats marked a new era of achievement ranging from the settlement of the New World, to space exploration. Noted for its unique throws, including hand decorated sunglasses and king cake babies, the Krewe throws a diversity of beads, cups, doubloons, and Iris-themed items. Booze, Beer, Bourbon and Broads. That's what you can expect as the Krewe of Tucks rolls following the stately and traditional Krewe of Iris parade. It all starts with the "king" seated on a giant toilet and the potty humor just keeps flowing. This somewhat irreverent group of men and women, really put on a great show. 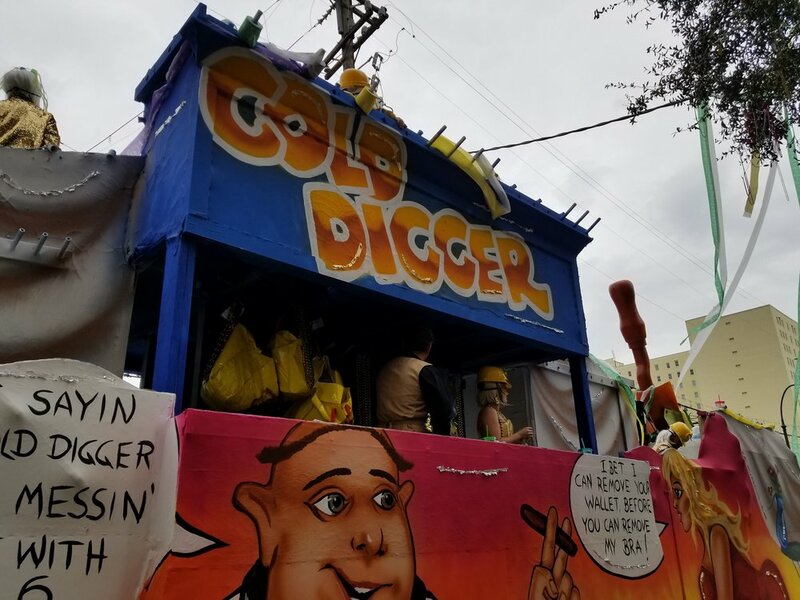 The 2018 theme was "50 Shades of Gold" a tribute to the krewe's 50th parade and the popular "Fifty Shades" movie series in theaters at the same time. Decorated toilet brushes and plungers along with Mardi Gras colored Tucks toilet paper are among the most coveted throws of not only the day, but perhaps all of Mardi Gras! It is possible to see Iris, Tucks and Endymion all in the same day. However, it might take a bit of planning, walking and waiting. Just check the parade route maps and see if you're really up to doing them all. Check out what it's like to be on the parade route in the video below!